The Power Play is one of the most universal running schemes in football. In order to defend it properly the defense must have all players on their game and completing their jobs. With that said, there are three players who must do their job in order for the defense to have any success. 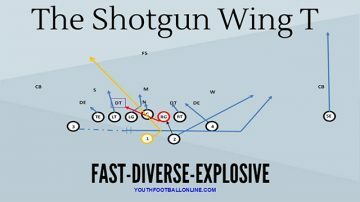 Regardless of the defense these are the players who are taking on the double team, the kickout block and the linebacker on the side of the play. The first, and some would argue most important, person when defending the power is the defensive lineman who is being double team. The Power is based on the concept of using angles and double teams to get movement on a defensive lineman. The lineman who is getting double teamed must first realize he is being double teamed. Once he has realized he is being double teamed he has to start working to beat the double team. In an ideal world he will split the double team by attacking one blocker and creating a crease to get through. If the defender feels himself starting to get pushed back he can drop to the ground to create a pile. This pile will at least fill the gap and force the running back to bounce the ball to the next gap. The next portion of defending the Power Play is the defender who is getting kicked out. Normally this is the C Gap Defender on the side the offense is running Power to. There are different schools of thought with how to deal with this kickout block but we base in a wrong arm technique. In this technique where the C Gap Defender (normally the Defensive End) realizes that he is going to be kicked out he will take his outside arm and rip inside of the kickout block. This again takes away the running back’s ability to run the ball inside of the kickout block. If this wrong arm technique is combined with the doubled defender at least stalemating the block, the runner will be forced to bounce the ball outside. The final defender that is important to defending the Power Play is the playside linebacker. When the Guard is pulling towards him he must attack slowly downhill. If the defensive lineman is not able to create a pile the linebacker knows the ball will hit inside the kickout block. This means that he must attack the Guard pulling towards him and destroy the block to make a play on the runner. If the defensive lineman is able to make a pile and the C Gap defender successfully wrong arms the kickout block, the runner will have no choice but to bounce the run to the outside. In this event the linebacker must see the ball bounce and come downhill to make the tackle in the C Gap. The Power is a very difficult play to defend. 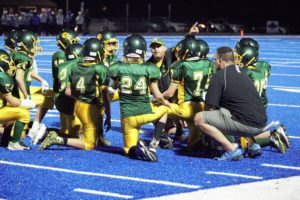 Luckily, most teams run the play so as a defensive coordinator you can spend time each practice working the different techniques required to stop it. If you are able to give your players the tools to stop the Power they will be much more effective at consistently stopping the Power for under 3 yards.